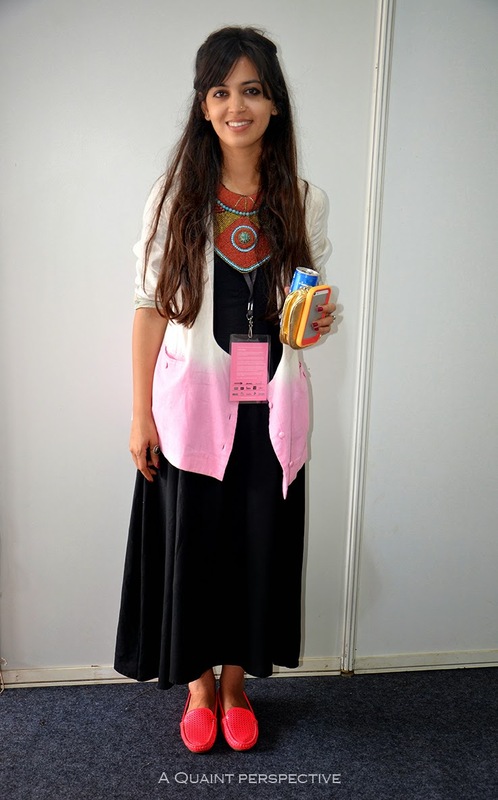 Karishma Shahani appeared to be just as rooted in her choice of attire as her last presentation at LIFW(see it here). This new designer on the block has every bit of Indian essence ingrained in her aesthetics and every bit young that we are as a nation. Guess we too are inspired by the PM's speech on our 68th Independence Day. 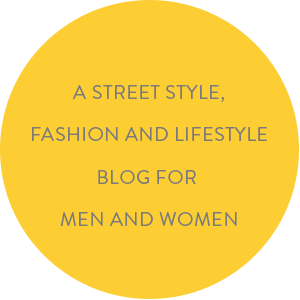 As we look back, our last few posts have been bohemian inspired looks and wonder if it reflects the state of mind. 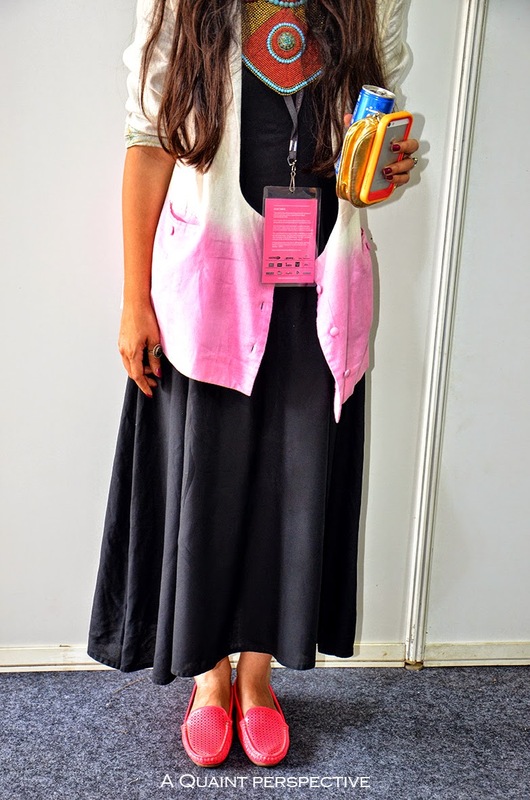 Karishma pairs a white full sleeved scoop neck Jacket in ombre dyed shade of pink with a black maxi dress, a Tibetan beaded choker and versatile bright loafers. 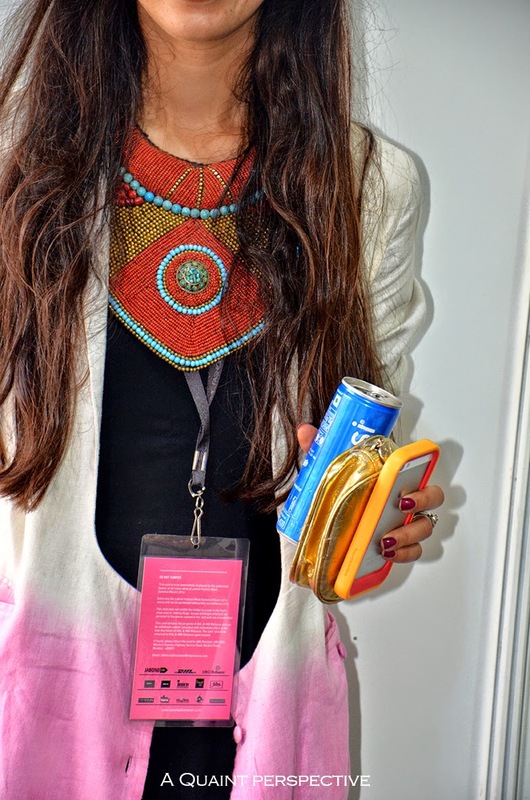 All set for a long day with an energy drink (almost seems like an accessory), the gold coin purse and the citrus colour covered phone add to the enigma of this boho girl. A Long gilet/jacket may seem like a non-essential, but we bet you’ll be surprised by its versatility. Team it up with jeans, shorts or jeggings and it can instantly prep up a look, take it up a few notches. On another exciting front, Lakme India Fashion Week - Winter Festive 2014 is about to commence and we shall do our best to bring you the best dressed. Follow us on Instagram to stay updated!